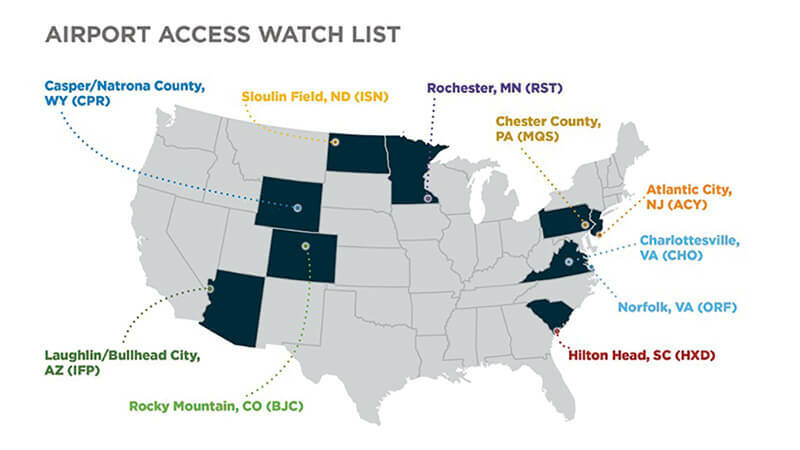 As part of an ongoing initiative to ensure fee transparency, airport access, and competition for critical services at publicly funded airports, AOPA has announced an Airport Access Watch List of 10 locations where the organization believes fixed-base operators with monopoly positions may be preventing reasonable airport access with their pricing practices, potentially putting them in violation of FAA grant assurances. AOPA intends to contact each airport sponsor and begin a dialogue about the conditions for transient general aviation pilots to access these public airports. AOPA’s goal is to ensure that pilots are able to land and park at each airport without being forced to purchase services they do not use, want, or need. There are several airports that have agreed with AOPA’s assessments on egregious FBO pricing practices, and some of those airports have unilaterally taken steps to correct these situations. We call them self-help airports, and they include Orange County, Waukegan, Syracuse, Santa Barbara, Heber City, and Cedar Rapids. AOPA President Mark Baker said he and his team are looking forward to working with the airports and community leadership at these locations as they have done in other locations. “The cooperation and steps these self-help airports have taken, along with the FAA guidance, provide a number of ways to approach the problem and ensure access is reasonable,” Baker said. More on these self-help locations can be found on AOPA’s website.